Born in Naples in 1839 he spent the first 25 years of his life growing up and studying art in Italy. 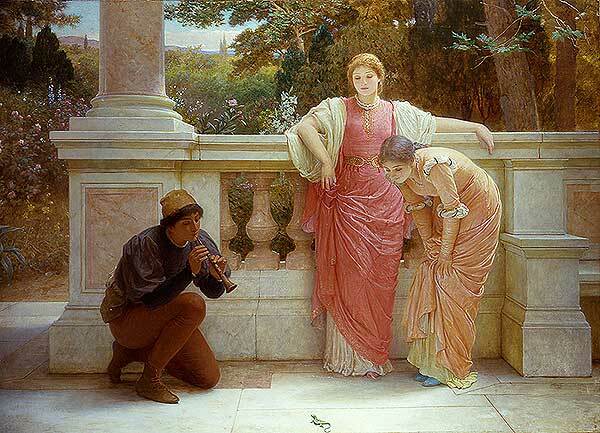 By 1855 Perugini had made the acquaintance of the great British Neo-Classical artist Frederic Leighton who was traveling and studying on the Continent. A strong friendship developed between the two and Leighton took the young artist under his wing… giving him great encouragement and financial support. There is much grace showing itself in A Cup of Tea, as well in the carefully drawn figure of a lady who sips the cup of tea as in the general harmony of color secured for the whole composition. Mr. Perugini understands the sense of rich effect in setting the creamy tints next the flesh, and in banishing almost entirely the colder colors. Among his many acquaintances was Kate Dickens (1839-1929), the daughter of Charles Dickens. Kate, an artist herself, was married to the historical painter Charles Allston Collins and their marriage lasted until Collins’ death in 1873. Soon after, her friendship with Perugini blossomed and the two artists were married. Throughout his career, Perugini continued to paint portraits and genre paintings that displayed his love for the ancient times in Greece and Rome and a great influence from Leighton and his fellow Neo-Classical artists. Among his most notable works are: Pompeian Interior (RA, 1870); Fresh Lavender (RA, 1878); Dolce far Niente (RA, 1882); Pandora (RA, 1893); A Willing Slave (RA, 1900) and The Green Lizard (RA, 1902). Graves, Algernon, The Royal Academy of Arts, S.R. Publishers, Ltd., London, 1970. Waters, Grant M., Dictionary of British Artists Working 1900-1950, Eastbourne Fine Art, 1975. Wood, Christopher, Dictionary of British Art, Volume IV – Victorian Painters, Antique Collectors Club, 1991. Waters, Clara & Hutton, Laurence, Artists of the Nineteenth Century and Their Works, Houghton, Mifflin & Co., Boston & New York, 1894.